The dark matter of the human genome may shed light on how the hormone androgen impacts prostate cancer. Researchers at the University of Michigan Rogel Cancer Center identified a novel gene they named ARLNC1 that controls signals from the androgen receptor, a key player in prostate cancer. Knocking down this long non-coding RNA in mice led to cancer cell death, suggesting this may be a key target for future therapies. The study is published in Nature Genetics. Current prostate cancer treatments aim to block the androgen receptor to stop cancer growth. But most patients become resistance to androgen-specific therapies, developing a challenging form of the disease called metastatic castration-resistant prostate cancer. "The androgen receptor is an important target in prostate cancer. Understanding that target is important. 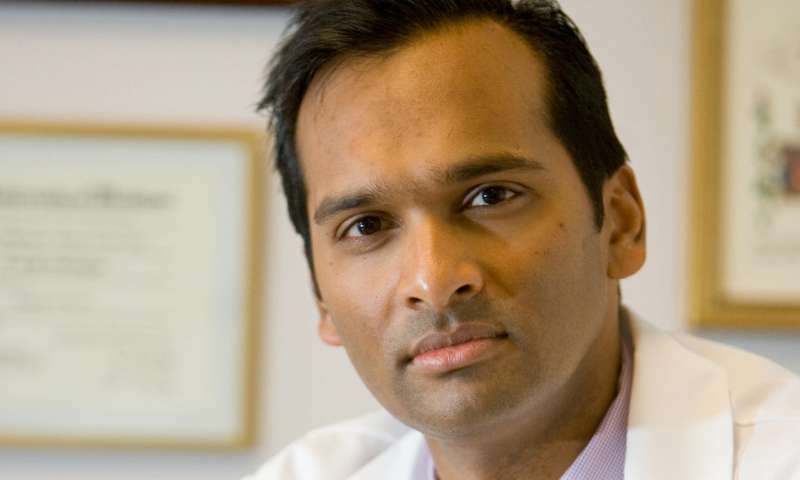 This study identifies a feedback loop that we could potentially disrupt as an alternative to blocking the androgen receptor directly," says study senior author Arul Chinnaiyan, M.D., Ph.D., director of the Michigan Center for Translational Pathology. Chinnaiyan's lab identified thousands of lncRNAs in a 2015 paper. Long non-coding RNAs are considered the dark matter of the genome because so little is known about them. While searching for lncRNAs that might play a role in prostate cancer, the team discovered that ARLNC1 is elevated in prostate cancer relative to benign prostate tissue, which suggests a role in cancer development. And it was associated with androgen receptor signaling, which made it more intriguing. The researchers found that the androgen receptor actually induces ARLNC1 expression. Then ARLNC1 binds to the androgen receptor messenger RNA transcript. This stabilizes the level of androgen receptor, which then feeds back to sustain ARLNC1. "At the end of the day, you're creating or stabilizing more androgen receptor signaling in general and driving this oncogenic pathway forward. We're envisioning a potential therapy against ARLNC1 in combination with therapy to block the androgen receptor—which would hit the target and also this positive feedback loop," Chinnaiyan says. When researchers blocked ARLNC1 in cell lines expressing androgen receptor, it led to cancer cell death and prevented tumor growth. In mouse models, elevating ARLNC1 caused large tumors to form. Knocking down ARLNC1 in mice caused tumors to shrink. Researchers plan to continue studying the biology of ARLNC1 to understand how it's involved in prostate cancer progression and androgen receptor signaling. "We want to further characterize the dark matter of the genome," Chinnaiyan says. "There are a number of these lncRNAs that we don't understand how they functionally work. Some of them will certainly be very useful as cancer biomarkers and we think a subset are important in biological processes."